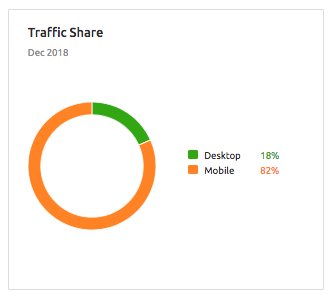 The Traffic Analytics Overview report allows you to gather estimates on any website’s traffic and make comparisons between up to 5 websites at a time in order to learn more about your rivals' strategies, explore user behavior, and reveal trends in your target market or niche. The report starts with estimates of the queried website's traffic and engagement. You'll notice a set of bars next to the top filters noting the Estimated Accuracy of the report - which is based on the size of the domain and any filters you have applied (historical data, location, device). The numbers in red or green beside the metrics indicate the change in the metric compared to the previous month. The time graph below the metrics shows their trends. By default, it is set to the past 6 months but it can also show 12 months or All Time - dating back to April 2016. You can switch to see the domain’s trend of total visits, unique visitors, average visit duration, or bounce rate. This graph could be used to understand the overall dynamics of the company’s website success and seasonal trends, as it helps locate traffic spikes related to marketing campaigns or any other reasons to research them further. Subdomains - These are most popular subdomains of a website in terms of estimated traffic. This table shows each subdomain’s percentage of the whole domain’s traffic, each total traffic and how much is coming from desktop compared to mobile devices. Traffic Sources - The sources of the website traffic over the past 6 months. With a Business subscription you can view this report in full and apply historical data and region filters in the Traffic Sources tab. The following is an explanation of what each source of traffic represents. Traffic By Countries - These are the countries that have the most users visiting the domain. Each country’s ratio of mobile and desktop traffic will be listed beside the country name. With a Business subscription, you can view the full list in the Geo Distribution report and apply various filters. Pitch Mode is an optional view of Traffic Analytics that helps you to present SEMrush Traffic Analytics data in a clean and easy manner. It’s useful for presenting to your prospects, customers, colleagues when you do not want to distract them with irrelevant details like SEMrush’s upper or left menu. Pitch Mode will simplify the view on your device, removing the SEMrush menus and hyperlinks so that there are no distractions. Use this mode to create a visually pleasing dashboard on a screen, or pitch your analysis to a business prospect or colleague. To exit Pitch Mode simply select the “Close” button or hit Esc on your keyboard. If you want to stay informed about Traffic Analytics news, updates, newly added months of data and more, you can ask to receive browser push notifications from this tool with the Notify Me button at the top of the report. After you select the option to receive browser push notifications, your browser will ask you to allow semrush.com to send you notifications. Hit “allow” from this dialog box. One of the best ways to make any type of research easy to access is to have all of the data in one place. The company info section shows all of the relevant information on any business you are researching. This data is provided accurately by Crunchbase’s machine learning algorithms, as well as an in-house data team and the Crunchbase community. You can compare several companies at once. Paid users of all categories have full access to this content. If you are a free user you can try this feature but only for our 3 sample domains.